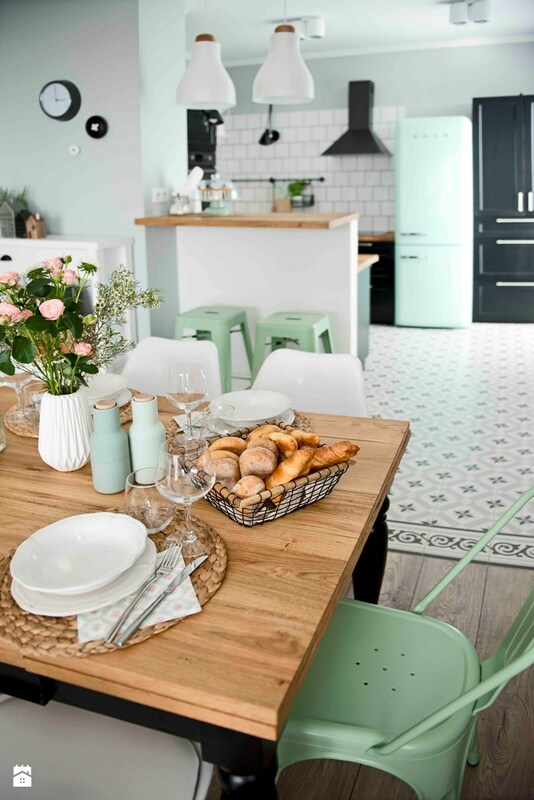 La Maison Jolie: How To Add Colour to Your Kitchen! During the Christmas break in the UK, my family and I were invited to dinner at a dear family friend's home. Aunty Jackie's home is as eclectic as she is. 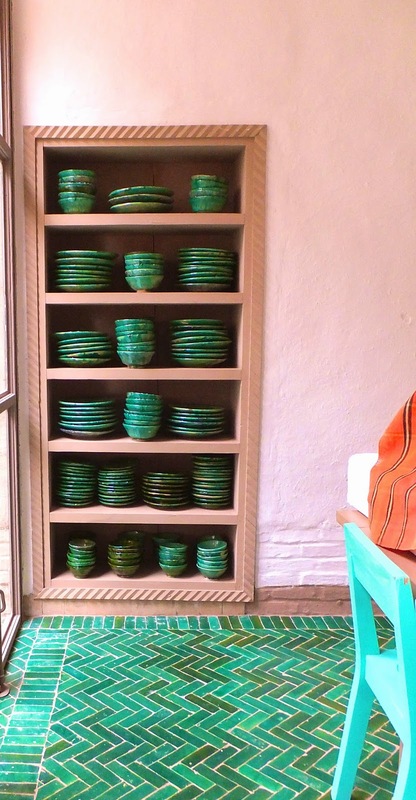 Bright yet moody colourful spaces, peppered with exotic cookbooks and souvenirs collected from her travels. Every room in her home is gorgeous, especially the dining room. The walls are a moody teal blue with gold accents, a large and long vintage sharing table, hand painted lamp shades and an entire wall with a hand painted mural! It sounds loud, but actually the overall effect in person is unique and stunning! However, my favourite room in her home would have to be the kitchen. Huge farmhouse style kitchen with the biggest kitchen table I have ever seen, a vintage AGA stove and two large farmhouse sinks. The bright kitchen is not only large but reflects her colourful personality and style with the most beautiful use of colour and colourful accents. It's a really happy, uplifting space where she spends most of time doing what she loves...cooking for her family and friends and running a super successful catering business. Which brings me to today's post on the challenge of adding colour to your kitchen space. 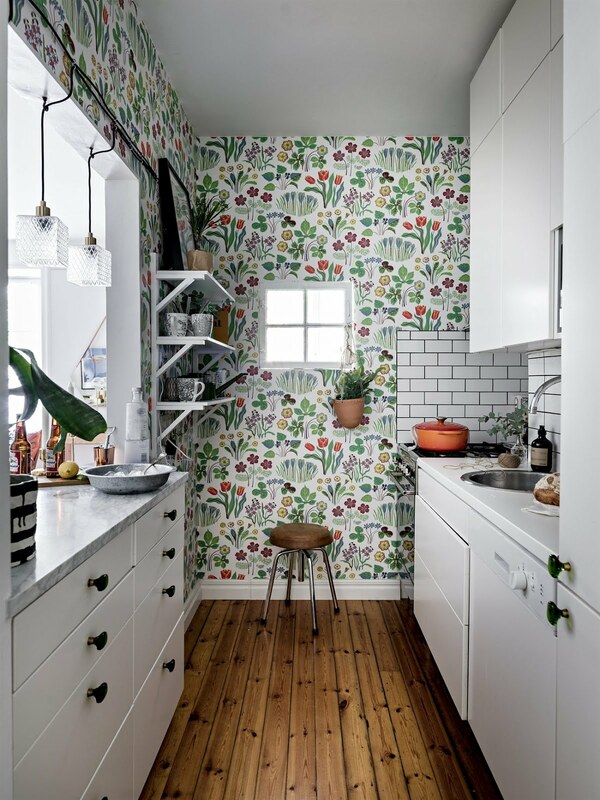 Most of us struggle with this, preferring a neutral kitchen décor with minimal colour, only choosing to add a small pop through accents and plants. However, for the eclectic, bohemian, wild child personalities like my beloved Aunty Jackie, colour is more than just hue, tone and chroma. Adding colour to a kitchen is not as challenging as some of us would like to believe. Colour doesn't need to dominate the entire space. Here are a few ways, you can add colour to your kitchen space without being overwhelmed. Step out of your comfort zone and freshen up the colour scheme of your kitchen by choosing to paint a feature wall in a complimentary shade contrasting with the rest. Or if you would like to be slightly less committal, choose to wallpaper! 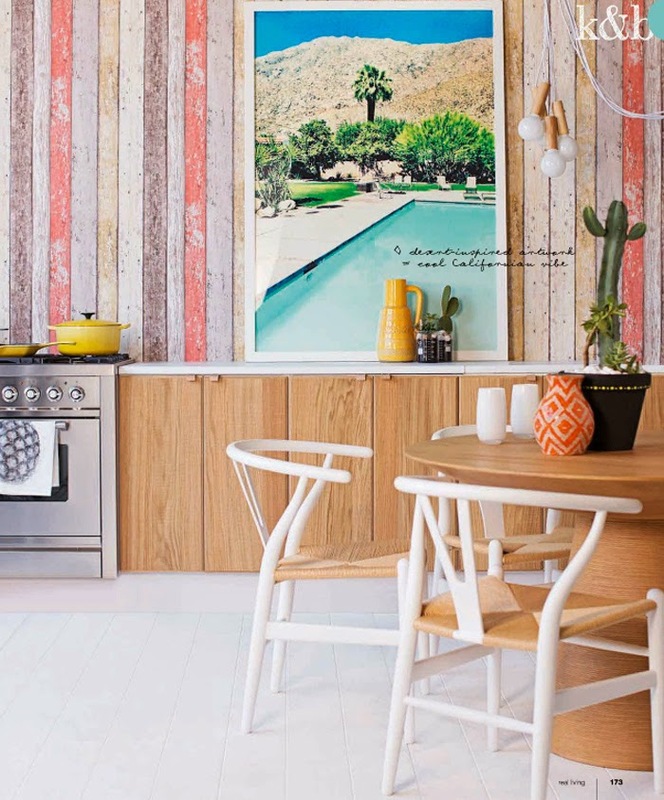 There so many gorgeous self-adhesive wallpapers available that mimic paint or why not create some really interesting effects with a mix of paint and wallpaper. Changing plain crockery, glassware and cutlery to colourful ones can add that touch of colour. Showcase your pretty plates and glassware on open or glass shelves to create interesting vignettes and enhance visual appeal. Builder grade kitchen cabinets and appliances can be colour safe and neutral. Make your cabinets pop with the help of some spray paint and colourful handles. When it comes to painting, you can also apply this idea to larger appliances such as fridges, stoves and ovens. Think retro like SMEG! Installing colourful glass splashbacks just might be that perfect practical and decorative solution you’ve been looking for to add vibrant colour to your kitchen. A large piece of art or a couple of colourful framed prints in the kitchen is an easy and affordable way to get some colour in. Add some fun accents taking your cue from the artwork to create a fun, colourful, cohesive décor. 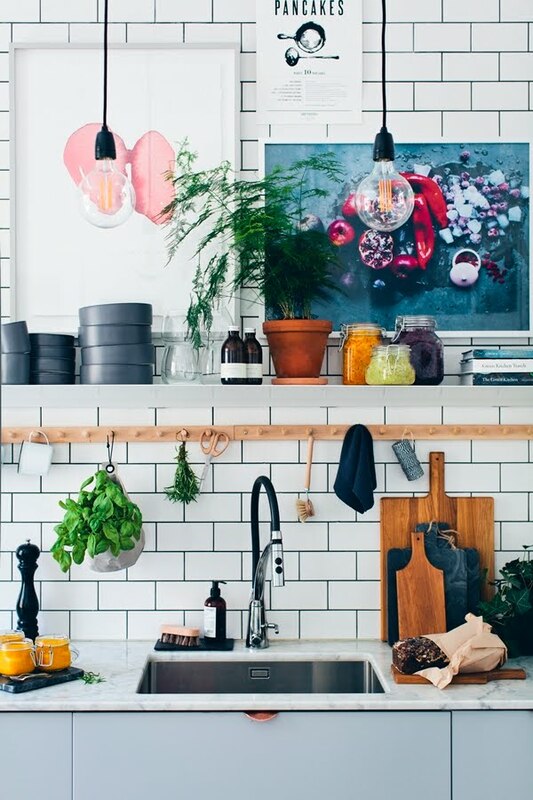 So there you go a few tips on how to add a little (or a big) splash of colour to your kitchen. Have you tried any of these in your home? 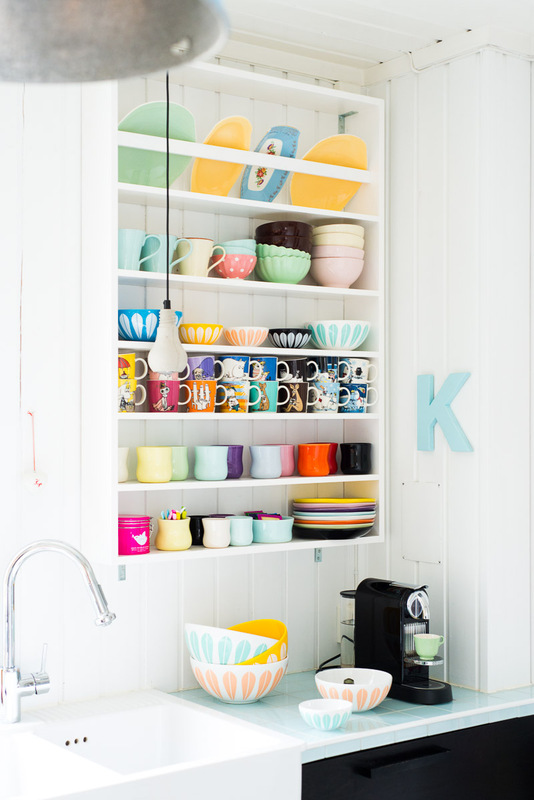 What are some of your favourite ways to add colour to your kitchen? Share with us in the comments below. Till next time...step out of your comfort zone!